WHOA! nice set up BabyDane! I'm jealous! I can't wait till I have the space to get my own freezer! As it is, I found a "mom and pop" place that sells ground raw for dogs as well as RMBs. Although I like the bones whole for teeth cleaning, it's what works best for us ATM... so their raw meals really just look like canned dog food unless they're getting chicken. I have a few pics of them eating chicken I can probably post tonight... Maybe I'll take a picture of the ground stuff too. 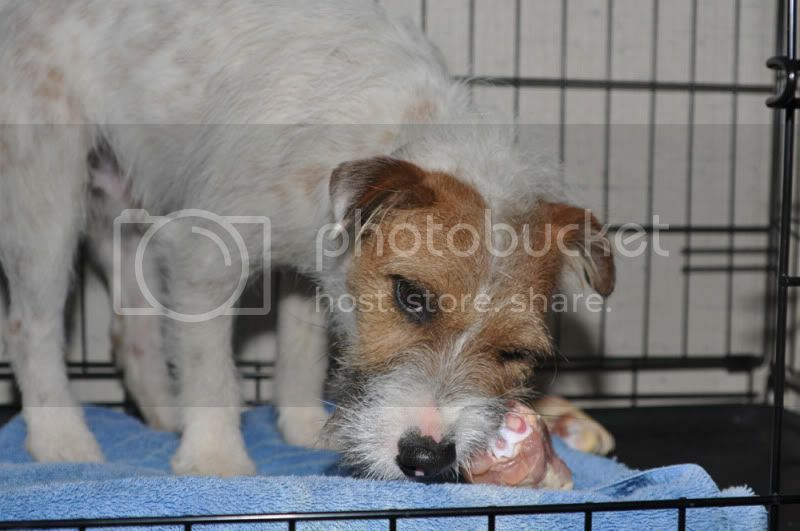 I only have a few pics of puppy Finn eating a lamb shank bone. I don't feed these anymore, usually turkey necks and chicken backs once a week, though now that I've found an asian grocery that sells necks, backs, shoulders and such for cheapo, I'll probably supplement raw more often, especially since Finn's on a medium-quality kibble right now as opposed to high-quality. Anyway. 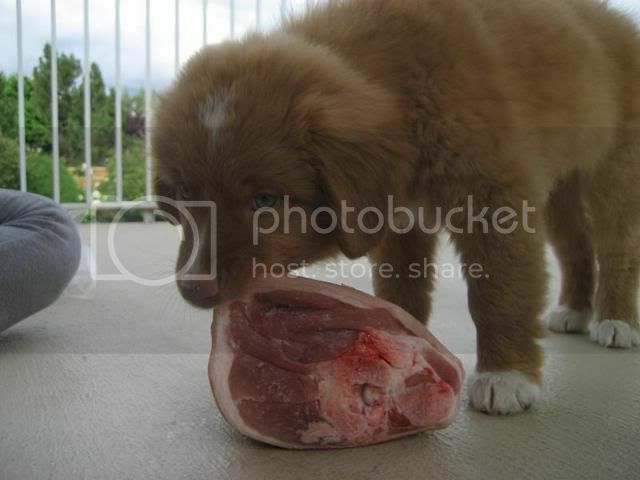 Puppy Finn nomming his first raw. 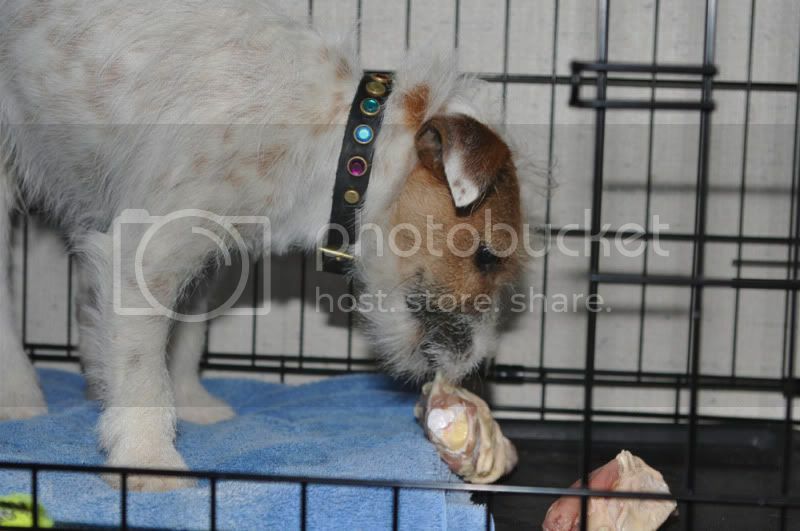 Usually he gets fed his raw in his crate, but I'll try and get some pics this week. Right now, I'm buying some premade ground stuff that is sold through a local butchers (just found out about it). It comes in tubes and actually has pretty similar ingredients to primal although it's 90% meat whereas primal was only 60%. It's less convenient but MUCH cheaper. Mia also gets wings and drumsticks and just regular chopped meat, liver, hearts, kidney, etc. On occasion they get cottage cheese and egg but to be honest I don't think they like egg much. Going to try sardines or fish soon. Summer is a work in progress. lol It's coming. Right now for her, it's pretty much all premade at this point. I have no pictures because I have no camera. Can I ask why people would buy Primal brand stuff that they could get in the grocery store for a lot less $$? 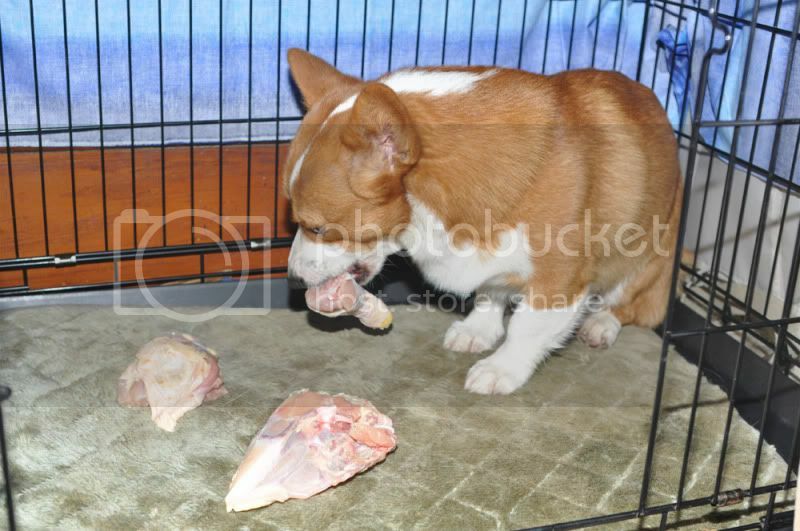 If you have a small dog, a small package of pork necks or wings or thighs is cheap. With my dogs I buy by the case. Last week I bought a case of leg quarters, a case of whole chickens, and a case of pork shoulders. Things I don't use as much of- liver, fish, etc, I buy at the grocery store. It really doesn't take that much space, you don't need a setup like baby Dane has, especially for a single dog or a couple small dogs. Just wanted to add that folks can check out ethnic grocery stores for more luck in finding the various cuts that work best for dogs. I can't find anything in my main grocery store except for chicken wings, but I can find TONS of other types, like turkey and chicken necks, chicken backs, pork necks, etc at the local Asian grocery. Definitely shop around a bit and you can probably find some great deals. The pre-packaged stuff is convenient, but is often overpriced. I used to get my chicken backs from the pet store, and I was paying TWICE as much as getting them at the grocery store. ETA: I think a lot of people use the pre made stuff because it is convenient and their dogs will happily eat it unlike RMB's. I think the premade stuff has flavorings added in to make it more palatable. And if people don't mind paying the higher cost to them I see no issue with it. I just think it's funny when I see just three prepackaged turkey necks for $8, when I get the exact same type of turkey necks for $.60 per pound. This new ground stuff is over $1.40 cheaper per pound than primal at the smallest size. The big size is even cheaper. I'm going to look around for an asian market, I found a couple mexican meat markets to check out. I would think there is an asian market here with so many international students. I found one. I'm totally checking it out this week. Hmm good to know. There's an analysis similar to primal stating the fat is 8% (min). It's just primal is so darn expensive! It's like $4 a lb. But it's right there in writing on the package that the fat content is 8% MINIMUM, so there is probably a LOT more fat than 8% because far is not really sellable to a butcher (unless he prepackages it up for raw feeders LOL). Fat is what is useful to dogs since that is where they get their energy from but too much fat is upsetting to a dog and they can actually get pancreatitis from it. 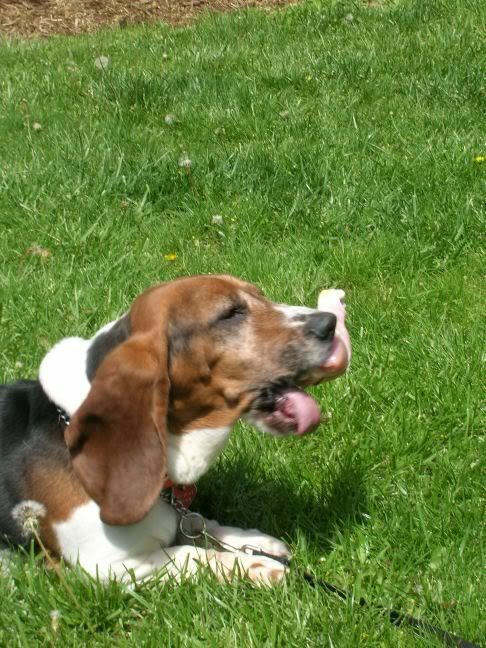 What you could do is feed it sparingly along side a heavy bone content meal to balance it out. Can't do that with Summer yet though. ETA: By the way it's actually packaged for raw feeders. It has kelp, etc in it, not just meat. I was wrong it is made through a local dog training and boarding facility, not a butcher. It's sold through the local feed store. The only differences I've noticed from it and the primal is a) price, it's not cut up in nuggets, and it has a higher meat content, lower veggie content. ETA: By the way it's actually packaged for raw feeders. It has kelp, etc in it, not just meat. 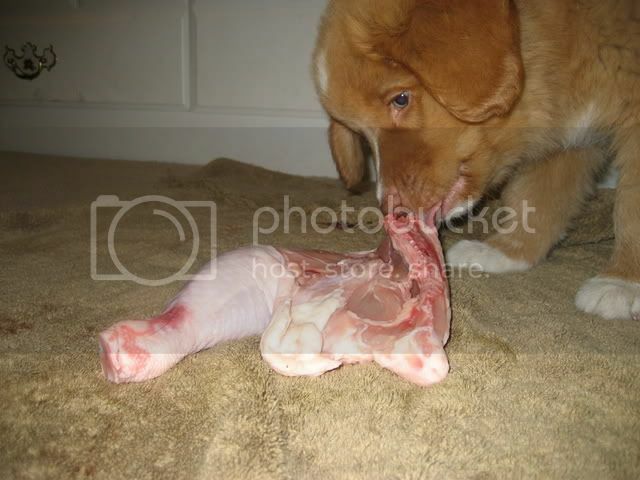 I was wrong it is made through a local dog training and boarding facility, not a butcher. Every dog food out there has their fat content at a minimum because some fat has to be in there, but a minimum percentage leaves it wide open for the manufacturer to add in as much fat as they want. Since mainstream foods wouldn't sell if they caused a lot of dogs to get sick, they probably do have approximately as much fat in the food as they state. But when a local butcher packs their ground together, that is not their main source of revenue and just their way to recoup costs with their scraps. My guess that they just don't have the feedback they need to know not to put so much fat in, although I'm sure there are butchers out there that have had enough feed back and they regulate their "raw product" a bit more. Ahh sadly I stopped taking pictures of Pit eating long ago. Turns out he isn't a fan. So old pics it is! 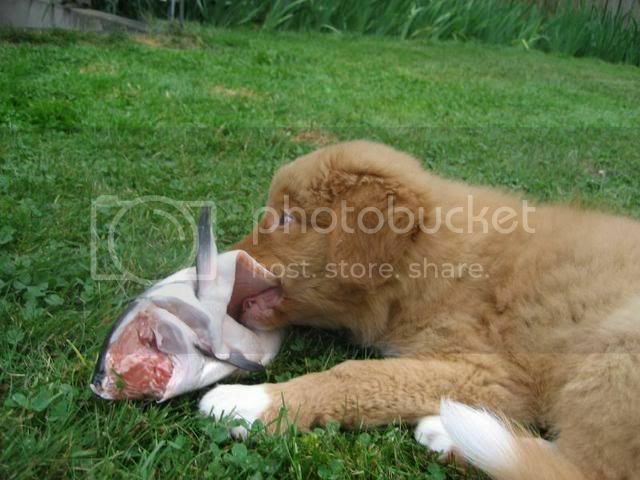 Enjoying a nice big salmon. Some unidentified pig part.. possibly a leg? I'm going to try it. The local person that sells it to the feed store is involved in Schutzhund and SAR work with his dogs. Apparently it's been sold a while locally. I'm not going to treat it as a complete diet though, just a supplement. I'm dying to know what you said in your CL ad to land a deal like that! Is that all meat from random strangers, or are butchers, markets or hunters etc contacting you mostly on there? People ask for organs from game since most hunters don't use them and also freezerburned meat. Yeah definitely try it. No harm in seeing what it's like especially when it's a lot cheaper than primal. We are looking for any unwanted meat that people are tossing. 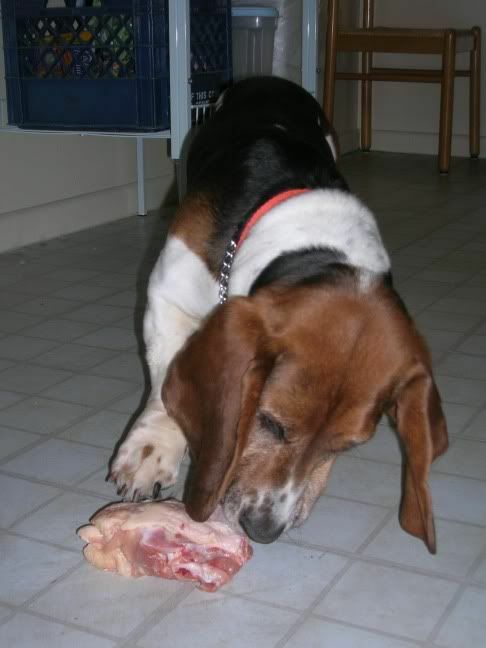 Our dogs eat a raw diet and any unwanted meat should not be thrown away! Please email me if you have anything, we are willing to buy this from you for up to $0.75 per pound depending on what it is. If its game meat (elk, etc) we would be happy to pay more than that, but email for details. I LOVE all the photos!! Thanks for sharing The organization is just awesome, I wish I could be that organized. The closest I get is labeling all the Ziplocs/Containers and then the bags I stuff them in! Keep the photos and stuff coming! Adding a pic of Finn's basket in the freezer. It's a bit barren as there hasn't been many sales on good snack meats lately, except for those turkey necks in the front. I scored those for 70 cents a pound at the market today. Woo! I only stuck them in the pic for pic's sake - they're in the fridge until I can cut them up, then back in the freezer. Behind the turkey necks is a bag of mixed chicken necks, gizzards and hearts that was on sale (freezerburned) at my local pet supply shop. The stuff you can't see is a small pack of chicken wings, some beef liver and like... one pork neck. I'm keeping an eye on sales in the next few weeks! Oh, and a question, does anyone feed oxtail? Wash says, "iz my chickenz?"